The Bryant Hornets, ranked No. 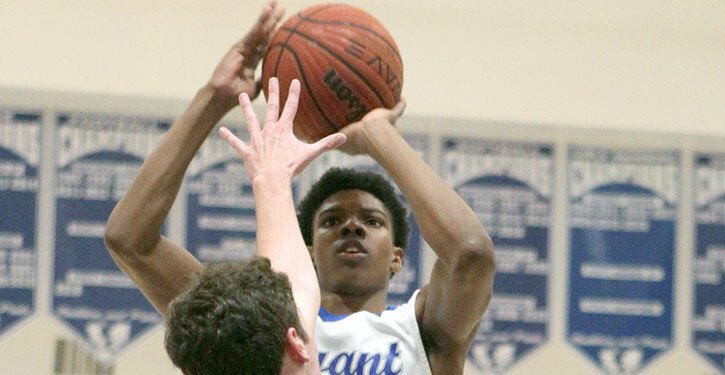 1 in Class 6A and atop the 6A-Central Conference standings, found themselves trailing the Little Rock Catholic Rockets, 31-22, at halftime on Tuesday night. They were plagued with foul trouble. Four of their five starters had two fouls and a top reserve was strapped with three. The Rockets came in with a good plan, attacking Bryant’s aggressive man defense, drawing fouls and shooting free throws. Catholic point guard Charles Daniel had 13 points at that stage including 9 of 11 free throws and the Rockets had shot 16 from the stripe to just four for the Hornets. “We had to adjust to the officiating and our foul trouble, and throw something new at them, go to Plan B on defense,” said Hornets head coach Mike Abrahamson. The coach had that Plan B tucked away. He didn’t want to go to it before halftime, so the Rockets wouldn’t be able to make adjustments in the locker room. Going deep into his bench, Abrahamson and the Hornets just held on as best they could until the break. When the third quarter began, Bryant jumped into a full-court zone trap. The result was a 24-0 run that completely turned the tables. The Hornets went on to capture a 62-51 win, their eighth in a row and 14thin their last 15 games. During the third-quarter blitz, the Rockets suffered nine turnovers. The Hornets’ Khalen Robinson scored 10 of his 18 points in the game and Treylon Payne had 7 of his 14. Rodney Lambert led all scorers with 20. The traps got the ball out of the hands of Daniel, who scored just 2 points and had just two of his 11 rebounds in the second half before he fouled out. He finished with 15. 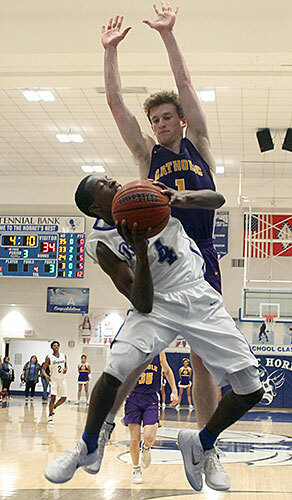 Josh Dawson had 11 for Catholic, which fell to 12-11 overall and 2-7. The third quarter began with a driving bank shot by Payne. 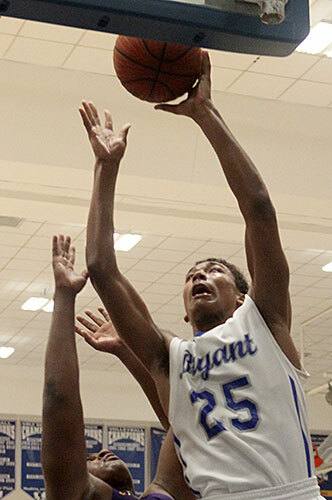 At the other end, Bryant’s Camren Hunter took a charge on a drive by Daniel, his third foul. Though Brian Flanagan’s three-point play moments later gave the Rockets their largest lead of the game at 34-24, the Hornets were set to take off. The blitz began with a 3 by Khalen Robinson. He added a jumper in the lane. Lambert made a steal and the Hornets were unable to take advantage, but another turnover led to a three-point play by Robinson off the offensive glass and, suddenly, the lead was just 2. Not only did the Hornets’ press force turnovers, it rushed the Rockets’ shots. After knocking down 8 of 15 shots in the first half, Catholic was just 2 of 10 in the third quarter. On an inbounds play under the Bryant basket, Robinson scored off an alley-oop pass from Hunter and the game was tied. Robiinson’s steal sent A.J. Jenkins to the line and forced a Rockets’ timeout. The break failed to curb the Hornets. After Jenkins hit a free throw to give Bryant a lead it would maintain the rest of the game, Robinson fed Payne for a 3. Payne added two free throws on Daniel’s third foul then he returned the favor to Robinson with a drive and kick for a 3 to make it 43-34. At the other end, Daniel was called for a charge. It was the fourth foul on the Rockets’ point guard. A three-point play by Lambert capped the onslaught with 1:19 left in the quarter. With :41 showing, Dawson broke the drought for the Rockets to make it 46-36 going into the final stanza. Lambert added another three-point play. Gamely, the Rockets whittled the lead to 49-42 with five minutes left. But, in rapid succession, Payne drove for a hoop and Daniel picked up his fifth foul as he drove into Hornets’ center Catrell Wallace. The Hornets began to spread it out on offense, driving through the gaps in the Catholic defense. Jenkins hit another free throw then Hunter fed Wallace for a layup. 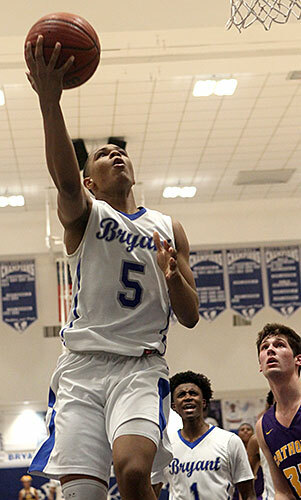 Hunter scored off a steal and, with 2:35 left, Bryant had its largest lead at 56-42. Bryant started the game well, running out to a 7-0 lead on a pair of baskets by Lambert and a 3 from Robinson. But the Rockets, sparked by Daniel’s drives that created kick-out 3’s or layups or trips to the line, grabbed a 16-12 lead by the end of the first quarter. Daniel shot 10 free throws in the second quarter alone and one Hornet after another picked up their second foul and came out of the game. With 2:40 left in the half, the Rockets held a 25-16 lead. Lambert drove for a couple of consecutive baskets to trim it to a 5-point lead but Flanagan hit two free throws, Jordan Edington turned in a three-point play and Daniel added a final free throw to push the lead back to 31-22. “Everything that could go wrong seemed to go wrong,” Abrahamson said. “So, what we wanted to do is we wanted to stick together, stick to our plan,” he said of his halftime talk. “Part of our plan was, if we needed to, to switch up into different presses and that’s what we did the second half. The guys really executed those things well. “We tried to speed them up there in the first half but the way we were doing it — Daniel is so good and he’s good at drawing fouls — we had to kind of switch it up to a more zone-type look. Of his team’s first-half scoring struggles, Abrahamson said, “They pack it in (on defense) and make it difficult on you. What they do is they make it really easy for you to settle for shots. Whereas you might get the same look but be more in your offensive rhythm and your offensive flow and the way that you like to get shots — the way that you get shots and what happens before you shoot it, is really important. The Hornets travel to Little Rock Central on Friday. Daniel 3-6 9-11 15, Porter 0-1 1-2 1, Flanagan 1-2 2-3 4, Dawson 4-11 2-2 11, Hannah 3-6 0-0 8, Kleine 0-4 0-0 0, Edington 2-2 1-1 5, Lloyd 2-4 2-2 7, Heird 0-0 0-0 0. Totals:15-36 (42%) 17-21 (81%) 51. Payne 6-13 0-0 14, Kl.Robinson 7-9 1-1 18, Lambert 8-12 4-7 20, Hunter 3-5 0-0 6, Wallace 1-3 0-0 2, Jenkins 0-2 2-2 2, Adams 0-1 0-0 0, Hall 0-0 0-0 0, Ks.Robinson 0-2 0-0 0, Montgomery 0-0 0-0 0, Schroeder 0-0 0-0 0. Totals:25-47 (53%) 7-12 (58%) 62. 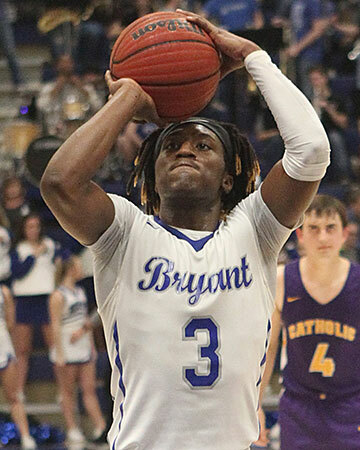 Three-point field goals:Bryant 5-16 (Kl.Robinson 3-5, Payne 2-5, Ks.Robinson 0-2, Lambert 0-1, Hunter 0-1, Jenkins 0-1, Adams 0-1), LR Catholic 4-12 (Hannah 2-4, Dawson 1-6, Lloyd 1-2, Kleine 0-2, Porter 0-1, Flanagan 0-1). Turnovers:Bryant 13, LR Catholic 20. Rebounds:Bryant 5-15 20 (Kl.Robinson 1-4 5, Lambert 1-3 4, Wallace 1-2 3, Payne 0-1 1, Hunter 0-1 1, team 2-4 6), LR Catholic 6-23 29 (Daniel 0-11 11, Dawson 4-1, Kleine 1-4 5, Hannah 0-3 3, Flanagan 0-1 1, Edington 0-1 1, team 1-2 3). Team fouls:Bryant 22, LR Catholic 17. Fouled out:Bryant, Kl.Robinson; LR Catholic, Daniel. Technical foul:Bryant, Jenkins.